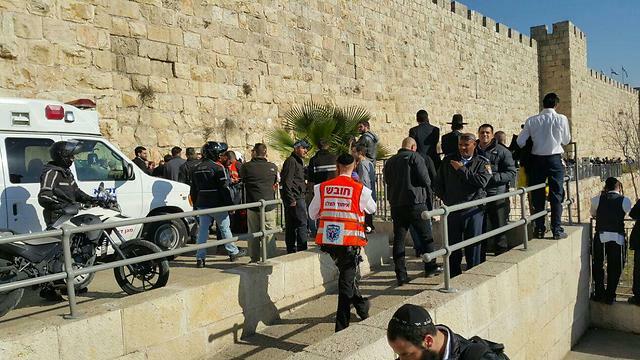 There has been a stabbing attack at Jaffa Gate, the major entrance to Jerusalem's Old City. Three Israelis are injured; one is in critical condition, evidently after being inadvertently hit by Border Guard fire; two others with knife injuries defined as serious. It's reported [Times of Israel, December 23, 2015] that the attackers were a pair of Palestinian Arabs. One of the victims is reported to have struggled with his stabber and was stabbed multiple times. Both of the knifers were shot by Border Guard fire at the scene. Both are dead. In the Arab media, they are named as Anan Abu Habsah Hamad, 20, and Issa Assaf, 19, both from Qalandiya. There's no confirmation of this from official Israeli sources since the pair were not carrying ID or other documents, according to the police. How likely is it that they are already elevated to the Palestinian Arab pantheon of murdering "martyrs"? Quite. (And for those anxious to see what the savages looked like, here's a Twitter photo.) Israel National News says both spent time in Israeli prisons in the past for terrorism offences. Two of today's victims were rushed to Jerusalem's Shaarei Zedek Medical Center, where the individual who had been shot was taken directly to the operating room. The other two victims were sent by ambulance to Shaarei Zedek and to Hadassah Ein Kerem hospital.